Part 2: A Happy Patient: What Drives Patient Satisfaction? Home / Part 2: A Happy Patient: What Drives Patient Satisfaction? In our last article, we supported a patient-centered way of thinking about quality improvement. More specifically, we addressed how a shift in focus to improved patient interaction and communication standards can impact the patient experience and, thus, influence patient satisfaction of care. We also mentioned that higher scores on the Hospital Consumer Assessment of Healthcare Providers and Systems (HCAHPS) are positively correlated with cost savings and staff engagement.1 As patient satisfaction is one of the two measurements for quality care, determining what drives patient satisfaction is a strategic place to start. 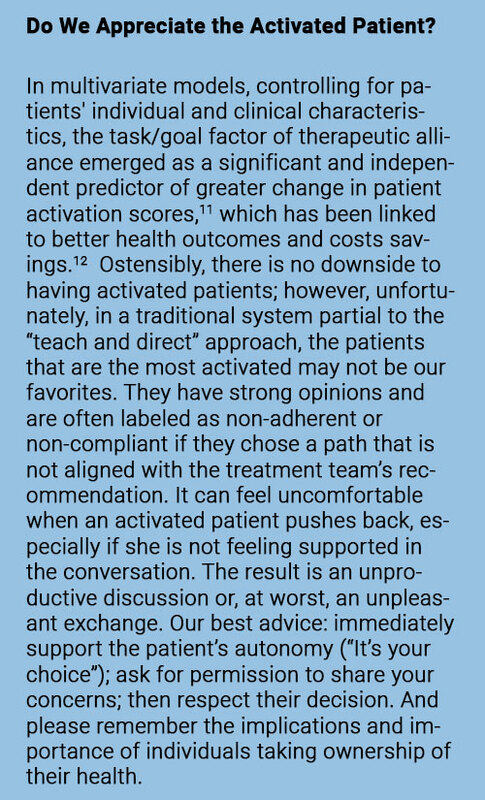 In a more recent study that analyzed patient satisfaction surveys to determine which attributes most affect patient satisfaction, authors concluded that the care provider’s interaction with the patient was the most impactful.6 Patients are most satisfied when their provider’s communication style supports their needs for active listening, support for autonomy, and demonstration of an empathetic perspective. All in all, a satisfied patient is one who is adequately informed but also adequately validated. Moreover, when active listening and displays of provider empathy are present there is less resistance and an improved sense of collaboration and positive rapport. In a classic study that supports a Motivational Interviewing and Rogerian Psychotherapy emphasis on empathy and reflective listening, researchers evaluated the impact of two counseling styles: one emphasized providing information (Teach) and advice (Direct) and one focused on reflective listening. They concluded that Teach/Direct increased client resistance by 70% in contrast to empathic listening.7 We will address more specifics on the importance of using evidence-based communication strategies, such as motivational interviewing, in our upcoming Part 4: Communication: Where It All Begins (and Ends). 2 Manary MP, Boulding W, Staelin R, et al. The Patient Experience and Health Outcomes. New Engl J Med 2013;368(3):201–3. 3 Mehta, Shivan J. Patient Satisfaction Reporting and Its Implications for Patient Care. AMA J Ethics 2015; 17(7):616-21. 4 Dagger TS, Sweeney JC, Johnson LW. A Hierarchical Model of Health Service Quality: Scale Development and Investigation of an Integrated Model. J Service Res 2007;10(2):123-142. 6 Johnson DM, Russell RS. SEM of Service Quality to Predict Overall Patient Satisfaction in Medical Clinics: A Case Study. Qual Manag J. 2015;22(4):18–36. 7 Moyers TB, Miller WR. Is low therapist empathy toxic? Psychol Addict Behav 2013;27(3):878–84. 8 Kim SS. The Effects of Physician Empathy on Patient Satisfaction and Compliance. Eval Health Prof 2004 Jan;27(3):237–51. 12 Mosen DM, Schmittdiel J, Hibbard J, et al. Is Patient Activation Associated With Outcomes of Care for Adults With Chronic Conditions? J Ambul Care Manag 2007;30(1):21–9.